This article is about the ancient Greek playwright. For other articles with similar names, see Aeschylus (disambiguation). 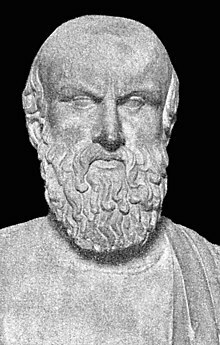 Aeschylus (525 BC—456 BC; Greek: Αἰσχύλος) was a playwright of Ancient Greece. He is the earliest of the three Greek tragedians whose plays are not entirely lost, the others being Sophocles and Euripides. Aeschylus' work has a strong moral and religious emphasis, concentrating on man's position in the cosmos in relation to the gods, divine law and divine punishment in the Oresteia trilogy. Besides the literary merit of his work, Aeschylus' greatest contribution to the theater was the addition of a second actor to his scenes. Previously, the action took place between a single actor and the Greek chorus. This invention was attributed to him by Aristotle. In addition, the existing canon of Aeschylus' plays includes a seventh, Prometheus Bound. Attributed to Aeschylus in antiquity, it is generally considered by modern scholars to be the work of an unknown playwright. One theory is that it was written by Euphorion, one of Aeschylus' sons, and produced as his father's work. Its language is much simpler than that which Aeschylus usually utilises, without nearly as much complex metaphor and imagery, and is closer to Sophocles' style (though it is not at all suggested that Sophocles is its author); its hostility to the figure of Zeus is completely at odds with the religious views of the other six plays. We know it must have been written before 429 BC, as Cratinus makes reference to this play in his own The Wealth Gods. Lost and fragmentary plays include Phineas, Glaukos Potnieus and Prometheus Pyrkaeus, a satyr play, belonging to the same tetralogy as The Persians; Laios, Oedipus and Sphynx, another satyr play, belonging to the same tetralogy as Seven Against Thebes; Proteus, the satyr play belonging to the Oresteia tetralogy; Eleusians and The Net-pullers. Cicero, Tusculanae Quaestiones (Tusculan Disputations).